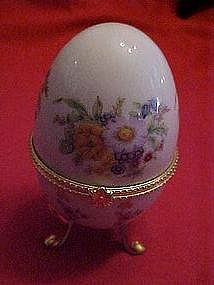 This pretty china or porcelain egg has lovely spring flower designs all over. Stands on three legs that are hand decorated in gold to match the pretty delecate look of the hardware that hinges the egg. Measures 4" tall. These are lovely to tuck away that special gift inside of it. Would be wonderful for Easter. Pristine condition.